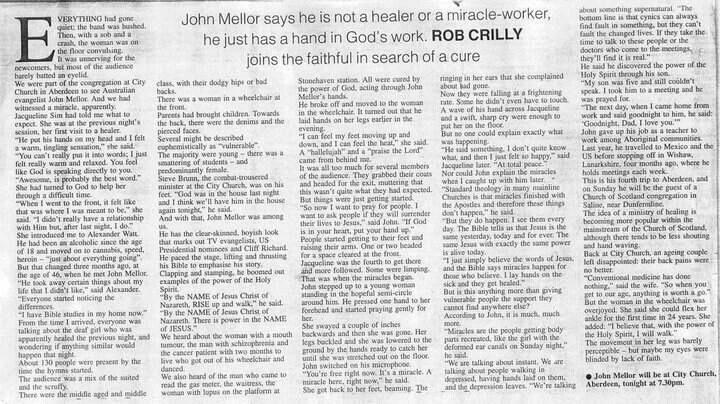 John Mellor- This article was done by one of Scotland's most respected newspapers 'The Press and Journal' about the miracles that were happening in Aberdeen. A young student had her deaf ears open at a special outreach for university students. A reporter heard about this and came to report on one of the healing meetings. So many were healed and he was amazed despite being a sceptic. Every major Scottish newspaper covered these meetings. We saw cripples get out of wheelchairs, blind eyes and deaf ears open, and every conceivable disease healed. We're looking forward to getting back to Scotland later this year. Awesome Jesus!!! Posted in Deafness & Blindness, Cancer & Other Diseases, Creative Miracles, Other Physical Healing, Other Signs & Wonders and tagged with scotland, john mellor, newspaper, article, reporter, wheelchair, cripples, blind eyes, deaf ears, disease healed. May 15, 2013 by Brae Wyckoff.